Earlier today, whaling company Hvalur hf, which in English translates into Whale Inc., announced that after two hunt-free years it is preparing its fleet to bring the commercial hunting of fin whales back to Iceland. The barbaric hunt, which began in 1948, is responsible for the gruesome murder of countless of the endangered whales in Iceland. Horrifically, after being secured to the side of a harpoon ship with rope, the dead whales are dragged to shore where they are then butchered for their meat to supply to Japan. Sadly, according to the Whale and Dolphin Conservation (WDC), the leading charity dedicated to the protection of whales and dolphins, Hvalur hf is now set to begin this year’s controversial fin whale hunting season on June 10th. 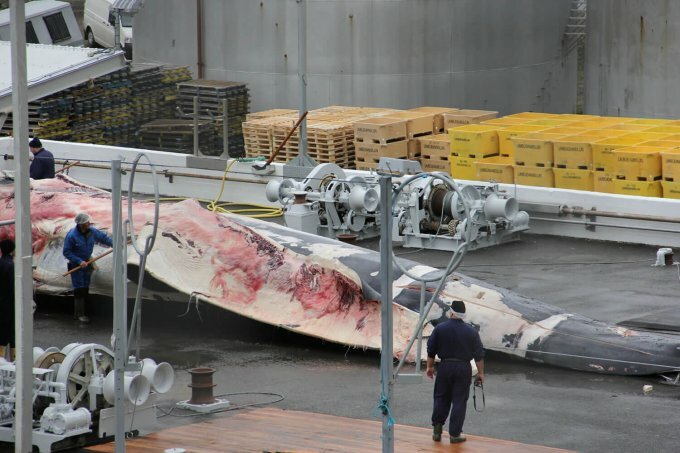 “As many as 161 fin whales could be killed, and the tally may even reach over 200 fin whales if the whalers also decide to exploit the second quota of 48 fin whales to the east of Iceland,” us.whales.org explained after sourcing the information from Hafogvatn. Reportedly, the company, which is ‘considering the possibilities’ of using dried whale meat extract in iron supplements for people suffering from anemia and using gelatin extracted from whale bones and other whale products in “foods and medicines”, has been collaborating with researchers at the Iceland Innovation Centre and the University of Iceland. The Icelandic company’s new marketing strategy was allegedly created to justify the return of the hunt of endangered fin whales for commercial purposes. The fin whale population is considered critically low outside the Central North Atlantic area surrounding Iceland, with an estimated 40,000 left in the region. Ways people can help the WDC are available HERE!